He couldn’t believe he was drinking see-through coffee from a little porcelain cup decorated with pink flowers, but what the heck. The things you do for love, right? 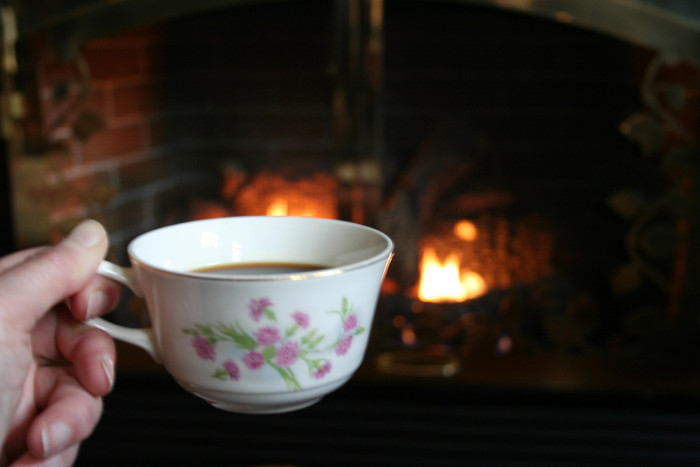 He had to build the fire for her and actually make the coffee, but she chose the cups and the number of scoops. “It’s fine sweetie. How’s your tea?” She drank lukewarm chamomile tea on cold winter afternoons when someone made it for her. She pulled out one of her favorites, “Sesame Street Library,” with Elmo and the little black puppy in it. “Here!” She thrust it in his free hand. He put down his cup on the coffee table and after she did the same, she cuddled up to him and he started to read. She leaned her old, grey head against his shoulder. Ben Richards loved his granddaughter but she was almost ninety now and her dementia was advanced. He wasn’t able to pass on the immortality gene to his children or theirs, so all he could do was visit and love them and watch them age and die. I wrote this for the Flash Fiction for the Purposeful Practitioner -2018 Week #2 writing challenge. The idea is to use the image above as the prompt for writing a piece of flash fiction no more than 200 words long. My word count is 195. At first, I wasn’t at all drawn to the image and thought I’d pass up this week’s “practitioner” challenge. After all, the cup is one that most likely an old woman or little girl would fancy. Then I thought of putting the two together. Time travel doesn’t work, but immortality does. There was an American TV show on in about 1970 called The Immortal starring Christopher George as Ben Richards. Richards is a test driver who discovers his blood contains an immunity to every disease known to mankind meaning that he never gets sick and will age very slowly. His brother, who disappeared years before may also carry the same blood factor, but whenever Richards gives a transfusion to someone else, the beneficial effects are only temporary. Naturally a greedy and aging millionaire wants to capture Richards so he can become his personal and permanent blood donor. Richards has to go on the run to stay one step ahead of the bad guys and try to find his brother. The show only lasted one season, probably because it had been done in so many other ways before (and since). My granddaughter (who is two-and-a-half) really does love the book Sesame Street Library in which Elmo goes looking for his little black puppy. Of course, everyone thinks he’s looking for a book “about” a little black puppy. Childhood hilarity ensues. Very nice James. I’m not familiar with the TV show, but think I would’ve enjoyed it. It would be nice to think that people with dementia have this kind of mindset where there is no confusion or anxiety, just a childhood innocence. Thanks. Not surprised you haven’t heard of the TV show before. It barely lasted one season and was pretty obscure. It was a interesting idea to include dementia, paired with immortality. There is at least one major drawback to immortality, the pain of watching the ones you love age and die. Thanks, Michael. It’s been written about before, but I was thinking of my own Mom whose cognitive abilities are slowly declining. That was quite a twist when I read about the gray hair. Really sad though that he is reading to his elderly grand-daughter. Makes me think immortality is definitely not so great. If you’re the only immortal it means leaving everyone behind with the passing of time, Deborah. Thanks for reading and commenting. Always love how a story develops. Some of mine start off in one direction and then suddenly they turn into something i never thought about. Thanks for the details. You’re welcome, Danny. Thanks for reading and commenting.